Provide 352 children and their families with Thanksgiving Dinner this year. Share the blessing of Thanksgiving dinner with children in need & Stock our Shelves! 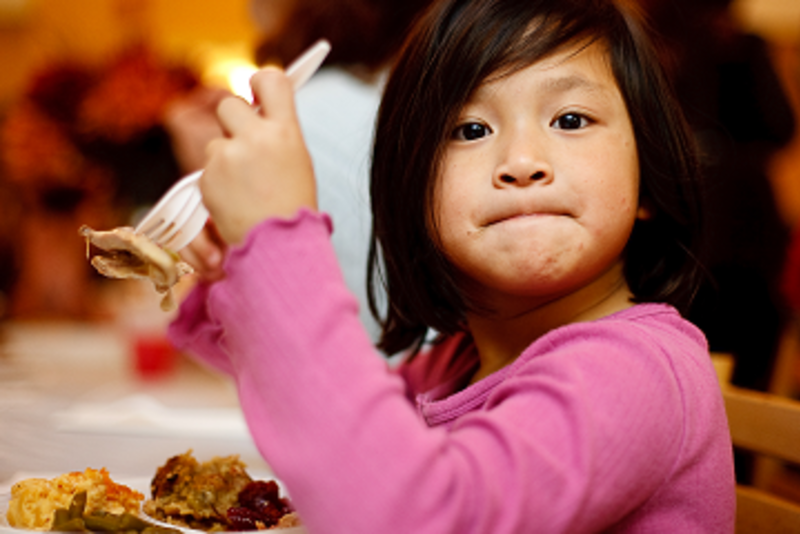 Your donations will provide 352 children and their families with Thanksgiving dinner this year! That means you will share the blessing of Thanksgiving dinner with 2,100 people right here in your own backyard! 100% of the funds raised will go to purchase food for families suffering from hunger. Many of us, myself included, take the joyful experience of sitting around the table with loved ones over a huge meal for granted year after year. However, many families won't be able to share that important meal with their children because of unexpected illness, job loss, or one of many unfortunate life experiences. BECAUSE OF YOU these children will not only have their bellies full on Thanksgiving day but also their spirits lifted as they give thanks for you and the help you give them through SEAM. Take a look of what your donations have done for Eric, Sarah, and their 5 school age children in just one month! Last month a family from Iraq come to SEAM for food and financial assistance after Eric temporarily lost his job as a researcher. His wife continued to work while Eric volunteered at SEAM 5 hours a day 5 days a week. Eric found a job and is now working until he can resume his role as a researcher! Your donations continue to help support Eric's family and thousands of families like his from the suffering of hunger and poverty! BECAUSE OF YOU and YOUR DONATIONS thousands of children and parents will get back on their feet, remain self-sufficient, and donate to help others who are experiencing the hardships they once suffered. Only 9 more families need your help for Thanksgiving dinner next week. Donate to help today! SEAM provides help for today and hope for tomorrow! We do this by offering emergency food and financial assistance and by connecting our neighbors with the resources needed for achieving self-sufficiency and well-being. 500 children and 1,500 single parents and individuals received the food they desperately needed in August Because of You! Please donate and help us feed thousands of children this winter.